As a Limited User you will not have the same rights the Standard and Admin user have, which means that some features such as upload, download, search, production and export multiple documents are not part of this type of user profile. If you believe you should have access to more feature or even administrative rights, please contact the Account Admin User(s) of your account. Lexbe eDiscovery Platform dashboard is located on the 'Home' Tab, to the left of top navigation bar. Once you log-in, you are automatically taken to the Dashboard. The Dashboard screen allows you to see all your cases custom field cases, select which case you are working on and see how many documents or files you have in each case. You can also view cases for all the accounts that you have access. You can also view all the ‘Case Sections’ ‘Case Fields’ by clicking on the 'Management>Account>Manage Case Fields' and Case Details pages. You work on only one case at a time in Lexbe eDiscovery Platform. To see which case you are working on, look to 'Current Case:' or the top right of your screen. This will show you which case is currently active (in the example, 'Demo Case 1'). The Dashboard screen allows you to see all your cases. You can select which case you are working on and also see how many documents or files you have in each case. To request access to Accounts, Cases or documents, you have to contact the the main administrator user account who control (enable/disable) rights to the users account. Clicking on 'Filter' will display cases based on Case Type (e.g. Civil, Criminal). When typing words using 'Case Details' and clicking on the 'Filter' button, it will also look for matching cases that contain specific words described on Case Details. You can filter by typing the 'Case Name', 'Case Number' or any other Custom Case Fields you have created for the current case. The Browse page is located on the top menu. It allows you to view and edit all the documents in your case. On the right side of the page is the is the main document window. 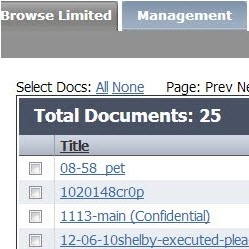 This shows all documents assigned to your case by the main administrator user account. Title. Shows the title of the document. By clicking the title, the entire document will be opened in a new window in PDF format. Folder. This is a description of the document type. Ext. 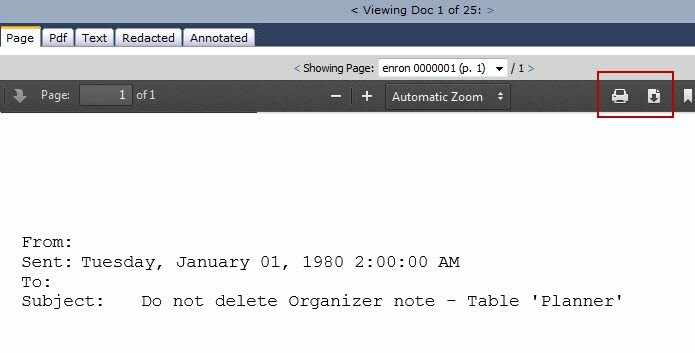 Shows the file type/extension for the specific document. Size. Indicates the file size in K bites. The Document Viewer enables you to view documents stored in your case, often in a application specific rendered version (such as PDF) and as text (if available). Lexbe eDiscovery Platform document viewer supports over 100 file types. These can include Adobe's PDF file format, native file types such as Word, Excel, PowerPoint and other Microsoft office file types. You can also view many also JPEG, BMP, TIFF and other graphic file types. If you any questions, please contact customer support.